Is there such a thing as “the perfect Los Angeles stock footage shot”? We think there is and we are constantly trying to discover it! What sets us apart from other stock footage sources is the way we photograph and compose multiple shots from the same location that allow you to select the best composition and time of day for your projects unique aesthetics. From wide shots, close ups, day, night, magic hour and time lapse you will not find a better single resource of Los Angeles stock footage. See Our Entire Collection on our – Homepage. Our clips are delivered as Quicktime MOV’s in ProRes HQ ready to drop right in to the post production pipeline. The length of our Los Angeles stock footage clips are longer than most stock footage providers. Clip lengths depend on the action taking place within the shot. Traffic lights & vehicle patterns, changing weather conditions, metro trains, camera slider movement or “in camera zooms” all effect how we select our final clip lengths. This lets our clients select the the best “sweet spot” within the clip for a more personalized stock footage experience. We return to the same locations several times during the year to capture various camera angles, times of day, weather conditions and traffic & pedestrian congestion. Over 90% of our clips are available in both 4K (UHD 3840×2160) and full HD (1920×1080) in 23.98 to satisfy current network and new original programming finishing requirements. Our clips are available after purchase via emailed download links. Our cinematographer Steve Irwin color grades every shot in Davinci Resolve using his 30 years experience as a senior colorist. Steve has graded 100’s of commercials and network television programs and now brings his personal aesthetic to this new and growing Los Angeles stock footage collection. 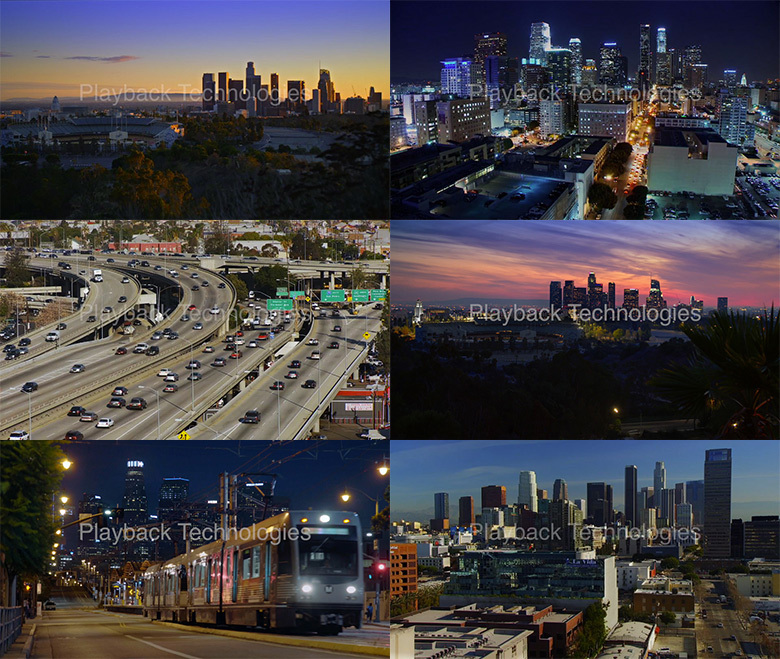 If you don’t see exactly what you need please contact Steve Irwin at (818) 556- 5030 or email steve24@playbacktech.com for custom Los Angeles stock footage and establishing shot photography.